101translations - General translation, confidential services, sworn translation, technical or specialist translation, translation of books and poetry. Alliance Française de San Francisco - Offers an interpreting service geared to provide solutions to your French and English language barriers. Its interpreters are available for business, corporate and one-on-one meetings, medical settings, communications, legal depositions, industrial and technical subjects. America Translating Services - Professional translators: translating, interpreting, conference interpreting. Babel Fish - Translate English, French, German, Italian, Portuguese, Spanish. dotSUB - A browser based, one-stop, self contained system for creating and viewing subtitles for videos in multiple languages across all platforms, including web based, mobile devices, and transcription and video editing systems. It's easy to use, nothing to buy or download, and it's fun. You can upload your videos, transcribe and time caption them, translate them into and from any language, and share them with the world. You can also embed the dotSUB player onto most websites and blogs with full dotSUB functionality. FreeTranslation - English to Spanish, French, German, Italian, Dutch, Portuguese and Norwegian. 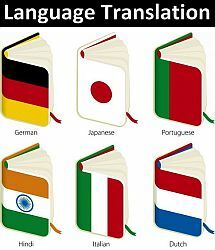 From Language to Language - English, French, German, Italian, Turkish, Russian, Spanish, Portuguese, Rumanian, Swedish, Danish, Polish, Czech, Hungarian, Finnish, Esperanto, Swahili, Serbo Croat multilingual translation dictionary. Google Translate - Translates words, phrases, and web pages between English and over 100 other languages. Google Transliteration IME - Google Transliteration IME is an input method editor which allows users to enter text in one of the supported languages using a roman keyboard. Users can type a word the way it sounds using Latin characters and Google Transliteration IME will convert the word to its native script. Note that this is not the same as translation -- it is the sound of the words that is converted from one alphabet to the other, not their meaning. Converted content will always be in Unicode. In Other Words - Professional translation services. Indian Translators - Hindi, Punjabi, Gujarati, Bengali, Tamil, Marathi; Spanish, French, German, Chinese, Japanese, Korean, Russian; multilingual expertise in over 100 languages. Language Portal: A Translation and Interpretation Digital Library - MPI's Language Portal gives you hundreds of state and local agency documents used to provide services to Limited English Proficient clients, including contracts, planning reports, and translated material. Begin with the basic search function, or use the advanced search to narrow your query by specifying a service area, keyword, service delivery component, or language. Language Translators - Translate words, phrases, web pages between languages, and identify a language -- English, French, Spanish, German, Italian, Portuguese, Brazilian Portuguese, Croatian, Czech, Danish, European Spanish, Finnish, Greek, Hungarian, icelandic, Japanese, Latin American Spanish, Norwegian, Polish, Russian, Serbian, Slovenian, Swedish, and Welsh. LXTrans - English to Spanish translation services for companies and individuals. Focuses on legal, finance and economy, science, pharmaceutical / medical, literary translations, architecture and engineering, marketing, and general & technical manuals. National Virtual Translation Center (NVTC) - Established for purpose of providing timely and accurate translations of foreign intelligence for all elements of the Intelligence Community. Systran Translation Software - Systran's software instantly translates text from and into 52 languages for individuals to understand and publish any type of information. Tlaxcala - International network of translators for linguistic diversity. TradExpert - In-house translators as well as freelance translators worldwide. Translation Experts - Translator and dictionary software for desktop computers and handheld. TravLang: Translating Dictionaries - Translating dictionaries. WinDi - Free online dictionaries with conjugation and grammar in Dutch, English, French, German, Italian, Portuguese, Spanish. This webpage last updated on Friday, October 6, 2017 3:24 PM.